These are a few more 3D printed rings. All three are brass. The upper left and lower right were inspired by the shapes of tourmaline crystals. The lower left ring is made with a Lidinoid minimal surface, similar to the previously posted ring. They are available at my store. 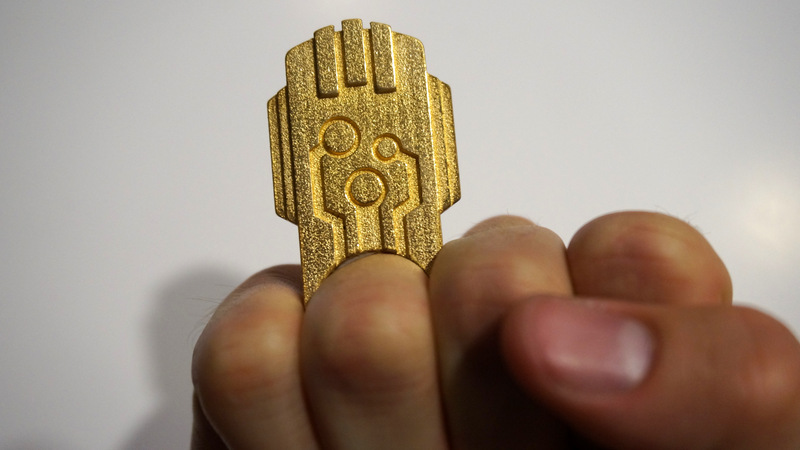 This ring is based on the weapon in the video game Transistor. It has a computer circuitry look to it. 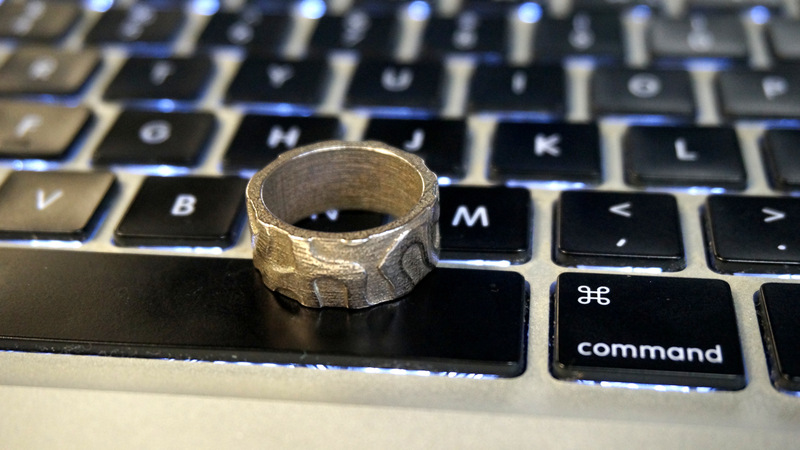 I designed this ring in 123D by Autocad. 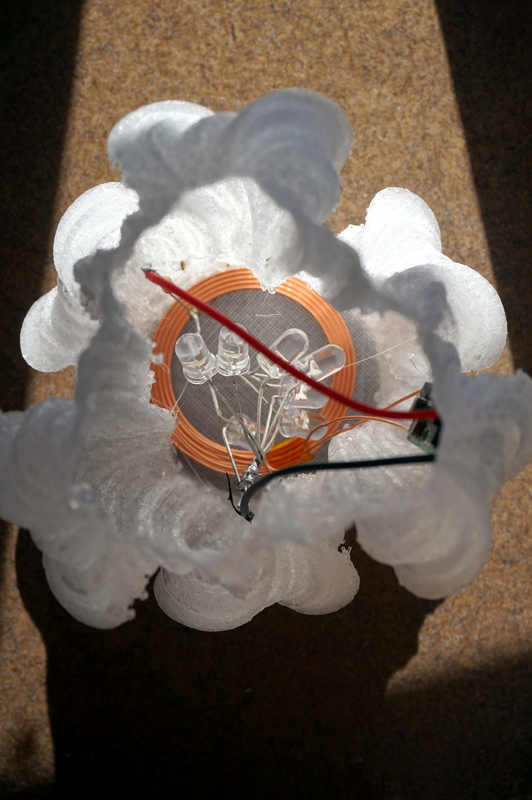 I had it printed in gold plated stainless steel to maintain the circuitry feel. It is quite top-heavy and the hole is slightly too big for my finger, so it doesn't stay perpendicular to my finger as I would like. Overall, I am very happy with the unique design and circuitry feel. 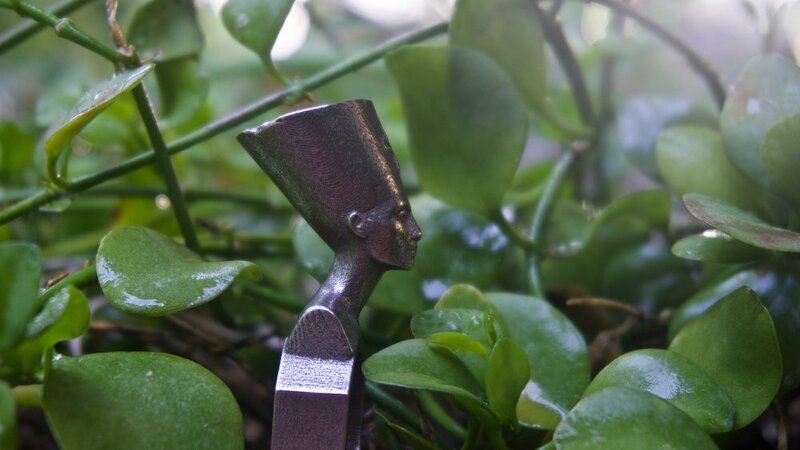 It is available on Shapeways. 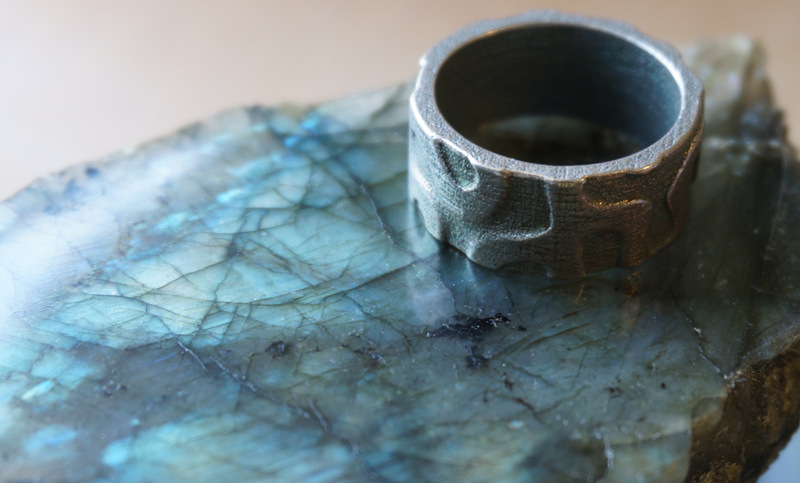 This ring was created with ShapeJS, a programming language made by Shapeways. The ring is the combination of two bands. The inner band (size 9.5 19.4 mm diameter) is 1.5 mm thick and provides a smooth surface. The outer band is made by intersecting a SchwarzD Minimal Surface with the outer band, a ring. As before, minimal surfaces are the minimal surface needed to connect given boundary conditions (like soap bubbles forming inside a ring of wire or a circus tent draped on poles. Here the minimal surface provides a quick way to make an interesting pattern. After the intersection, the corners are rounded. Currently the minimum feature size is 1mm thick, so sharp corners or very thin features need to be smoothed out for printing. To help with printing I made the SchwarzD pattern very thin with a larger period. It is not easy to get a sense of the minimal surface from the final ring design, but the pattern it produces is interesting. It reminds me of waves in sand. Here is a link to the ShapeJS minimal surface ring example. 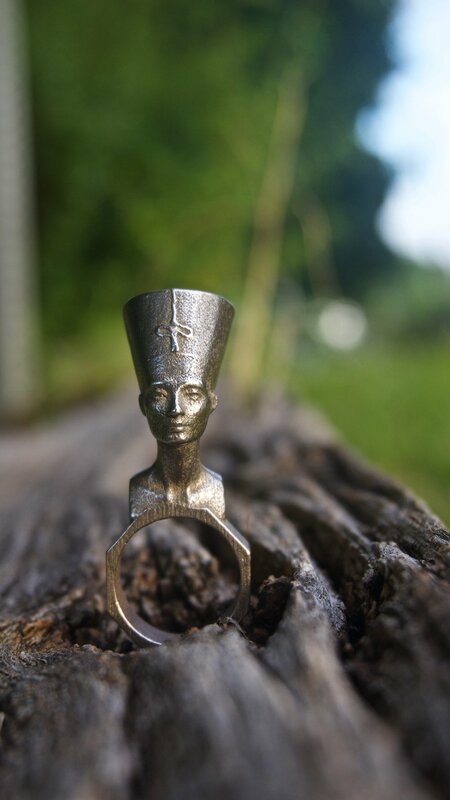 SchwarzD ring is now available on my Shapeways store. Bottles, especially bottles of alcohol, are all so beautiful and uniquely shaped. I hate just recycling them when they're empty, but keeping keeping empty bottles seems like a waste of space. I also love plants, but watering them can become a chore. So, I've taken interesting old bottles and filled them with plants. This way I can keep the bottles, and the plants need watering less often. So far, 750 mL bottles are a good size. They are 1/3 full of dirt and 2/3 open for the plant to grow. Each terrarium has coarse alabaster in the bottom to help drain the soil above. Between the marble and soil is activated charcoal to help limit mold and fungi growth and release nutrients to the plants. The terrariums are left open, but with such narrow necks they stay quite damp. Plants that do well in these conditions require nearly continuous moisture. Some plants I've tried just end up dying. 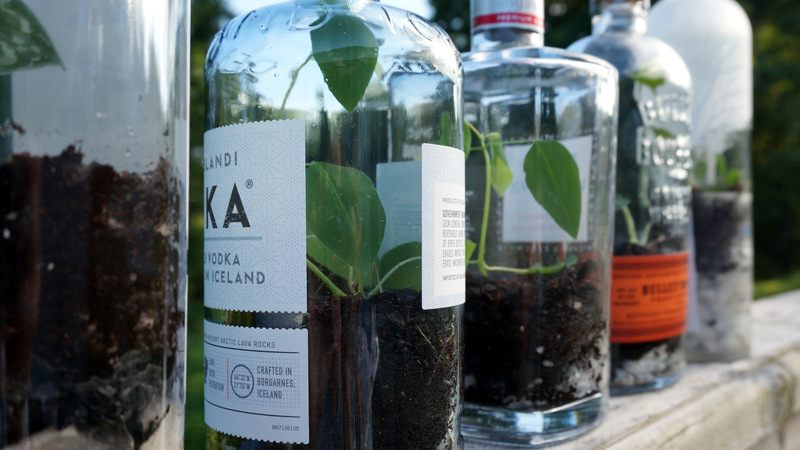 At first I tried sealing the bottles, but the plants quickly died. The plants in the sealed terrariums may have been too large for the container. This would cause them to use up limited nutrients before reaching equilibrium in the system. Interestingly, a similar result was seen at a much smaller scale when confining populations of cells. Chambers with few initial cells grew while chambers with many initial cells did not grow. Slow groing plants work better. Fast growing plants tend to grow out of the neck of the bottles. Finally, they should be left to grow in bright rooms but never direct sunlight. Direct sunlight will cause the terrarium to act like a car on a hot day and cook the plant inside. The picture on the left is an egg in a 3D printed voronoi coquetier, or eggcup. At least on the surface, complexity seems reversed from what is typical. That is the inorganic eggcup has a much more complex structure that the simple curved biological egg. In contrast, the varied structures of the succulents to the right are more complex than the plain pot they're in. While complexity between the egg and eggcup at the macroscopic scale is reversed, the minimalism of the egg hides far more complex nanostructure than the eggcup. The egg has the potential to make a quite radical transformation into a bird with many types of tissue displaying varied structures. 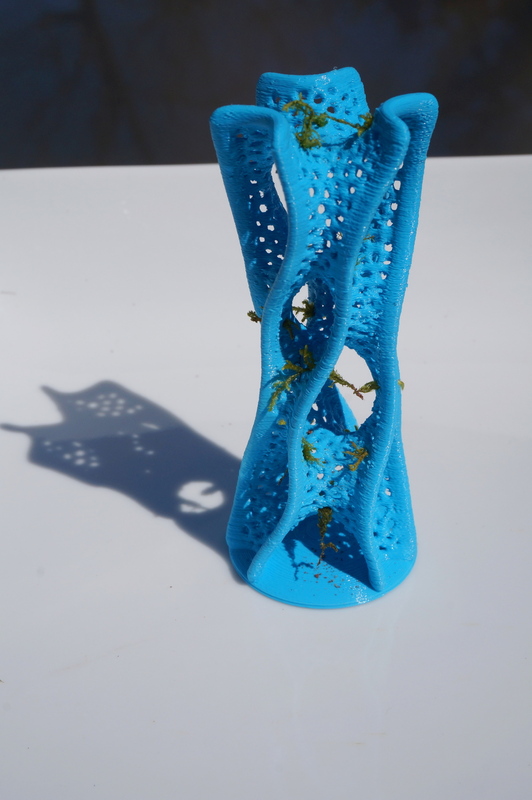 Interestingly, biology and 3D printing are starting to merge and create objects that are complex across many scales. Biobots makes printers that create biocompatible scaffolds that support cell cultures and grow organs. The coquetier was designed by @Gregoware, downloaded from @thingiverse and printed on an @ultimaker. My friends ate a cured ham with Thanksgiving dinner a few weeks ago. They thought something like mold or fungus was growing on the outside. I thought it was just salt, but I collected some into an eppendorf tube to look at later. I went home for Thanksgiving and my friends stayed and cooked the ham. They first washed the outside (removing what we though was salt or mold) and then soaked the entire leg in water for a day. This was to draw out the salt that was used to cure the ham. They then cooked it in the oven and enjoyed it. About two weeks went by until I could look at the sample under the microscope. By the time I put the sample on a microscope slide it had collected moisture and was much wetter than when I collected the sample. 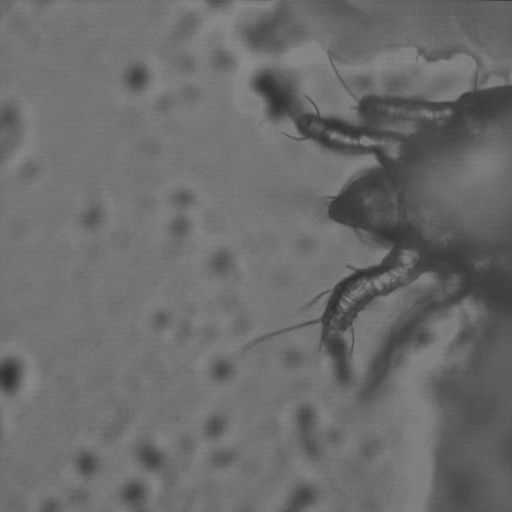 First, I scraped some of the sample on a number 1 coverslip, and mounted it on an inverted Nikon microscope with a 20x air objective (the 100um scale bar applies to all images). At first I saw dried salt crystals. As I looked at the sample it was drying out. I switched from backlit to fluorescence, and some of the crystals were fluorescent! They lit up the crystals around them. The center and right images are in the same location, but the center image is fluorescent while the right is backlit. Fluorescence was excited at a peak of 532 nm (blue-green) and the emission peak was at 595 nm (yellow-green). Then I saw this large shadow, and it was moving! It looked like a large bug. I recorded a video over about 7 seconds, imaging frames as fast as possible. Just after the video was recorded it stopped moving, and I could not get a better image of the bug. I think it was alive and either dried out or got cooked to death by the lamp illuminating the stage. After some searching, I learned cured meats can harbor pests, including mites. They are about 800um long (which this one appears to be), and they have eight legs, four in the front and four in the back, with little hairs growing off the legs. These live on the outside of the meat only and can be easily washed off. This was a learning experience. I don't think the mites were harmful, but they do look gross. Bitcoin (BTC), the cryptocurrency, is supported by a network of independent miners and is always mining blocks. Each block is a challenging computational problem, and the difficulty is adjusted based on the computational power of the entire network so that one block is mined every 10 minutes. The computer that mines the block (solves the problem) collects the transaction fees associated from any transactions processed in that block and, currently, 25 new BTC. So, given we can estimate the reward for mining a block (in BTC) and the amount of electricity the network spend mining the block, can we quantify the value of BTC in dollars (USD)? The left hand side of the equation is the number of BTC per block. We have already covered new BTC. This amount of new BTC decreases by half every 4 years, and the last new BTC is expected to be awarded in 2140. So why mine blocks when no more coins are being awarded? When the block is mined, transactions are processed. These are other people, not necessarily the miner, exchanging BTC. If someone wants a transaction processed they attach a fee. These fees are awarded to computer that mines the block. In the long run individuals will only continue to mine if the reward, transaction fees, offsets the cost of mining, electricity costs. We will ignore capital and overhead costs (e.g. taxes, cost of buildings, miners, and labor) to simplify the analysis, but including these will increase the lower bound of dollars per BTC. We rearrange the first equation to get dollars per BTC. The 1/6 hour is assuming one block is mined every 10 minutes. This is not always the case. With the assumptions above, the equation predicts $830 for 1 BTC. This is slightly above the current exchange rate of about $420. Indicating that BTC is currently undervalued relative to the resources used to make those BTC (the amount of electricity used to make BTC is greater than the worth of those BTC when converted into USD). The calculated exchange rate is quite sensitive to the average cost of electricity across the network and the average efficiency of the miners used. If the cost of electricity is instead $0.01/kWh the exchange rate drops to about 1BTC=$166. Similarly, if the miners are more efficient, say only 0.5 Watt/Gigahash, the exchange rate drops to only 1BTC=$83. Other explanations for people paying more in electricity than the value they get include people mining for fun, as insurance against holding centralized currencies, or expecting the value of BTC to increase dramatically. For example, after the next halving, expected in 2016, the reward of new BTC will drop to 12.5 per block, and the exchange rate predicted by the equation jumps to about $1,653. In the extreme case, when new BTC are no longer released and the only reward for mining is transaction fees, the exchange rate predicted is 1BTC=$208,000 (assuming the cost of electricity, mining efficiency, number of transactions per block, and transaction fees are the same in 2140 as they are today, lol). With the new BTC rewarded at zero, the hashrate of the network would have to drop to only about 500,000 Gh/s, from the current 500,000,000 Gh/s, for the exchange rate to be about today’s rate. In the end, this was a fun exercise to put some numbers on the resources being put into BTC and compare those to the current value of BTC. This analysis suggested BTC is currently undervalued, but in reality, BTC's value derives from many different sources including an alternative to restrictive currencies, purchasing drugs, or protection against inflationary policy. Biotechnology has so far relied on microbes. They produce beer, bread, cheese, yogurt, insulin, chemicals, flavors (like vanillin), and many other products. Some of these microbes were found naturally and others were altered with metabolic engineering. The output of a product from engineered microbes generally depends on the scale of the reaction. On the lab scale, microbes may show high concentrations but when the bioreactor is scaled to industrial levels the concentrations drop. This presents a major challenge for researchers engineering microbes. Their lab scale microbes perform wonderfully but commercialization fails. Cell-free synthetic biology is becoming an alternative to metabolic engineering. Cell-free reactions only use parts of cells to carry out reactions, so nothing needs to be kept alive. Additionally, the only reactions happening in the system are those that contribute to the desired product (when using cells many reactions are necessary to just keep the cells alive). Cell-free reactions are easier to manipulate and quicker to run. Fortunately they are also scale independent. Zawada et al. tested the scalability of cell-free reactions for cytokine production. The plot to the right shows their main finding. Concentrations of products are plotted versus time. The different curves represent different scale reactions from 250 microliters to 100 liters. Note that all the curves line up, so at any scale these reactions happen at the same rate (produce the same amount of product per time). This is another benefit of using cell-free reactions. The function of proteins is determined by their shape. Proteins are made of chains of building blocks, amino acids. The amino acid sequence is the primary structure of the protein. Amino acids all have unique properties (size, charge). Protein shape determines if the protein prefers interactions with water (hydrophilic) or oil (hydrophobic), binds oxygen, or harvest light. The study of protein structure (crystallography) is a very important. There are two main approaches to determining protein structure: X-ray crystallography, and nuclear magnetic resonance (NMR). Structures are then stored in the Protein Data Bank, which currently has 100,000 structures. 3D printing proteins could be an easy way to interact with their structure. I'll be following this guide written by Forrest Yeh. I chose to print ubiquitin because as its name suggests, it is ubiquitous in eukaryotic organisms. It attaches to proteins after they've been made (post-translation) and regulates their activity, location, live span, and other cell processes. After downloading the .pdb 3D crystal structure from Protein Data Bank, the best way to view the structure is with UCSF Chimera. You can change the way the structure is visualized from spheres for each atom to a cleaner and more informative ribbon with alpha helices and beta sheets (secondary structures). The visualized protein can then be exported as a .stl file which can be input into a slicer program to convert the model to G-code (3D printer commands). Protein structures are very complex and require many scaffolds. This makes printing them difficult. The right image is the first few layers. The many dots will be the scaffolding structure. The left image is the final printed protein. There are a lot of scaffolds inside the print. Below is an image of the final protein. On the top are beta sheets (the long flat structures). On the bottom is an alpha helix (cork screw structure). There is still some scaffolding left because the print messed up in a few places and if I remove the scaffold the protein will break. Over all this was a fun project but next time I'll have to either scale the protein up to make the features bigger or slow the printer down to catch all the details. The minimal surface, vertical moss garden is growing well! I water it twice a day by pouring water on the top of the tower. I'm keeping it covered with a glass to keep the humidity high. After a day in the sunlight, condensation builds on the glass. The pencils leave a small gap to allow some air exchange. The moss at the bottom of the surface (closest to the water) are growing much better than the suspended moss. I think this is because the bottom is wetter. I've added plant food for acid loving plants to the water to provide the moss with nutrients. There is growth in both mycelium cultures. The one in the bottle is growing much better. The culture does not look like a solid mass yet. I'll wait a little longer to see if it grows denser. The culture in the cup is not really growing. This may be because I seeded the culture with mushrooms instead of spores. This culture also has a small mold contamination (green spot in upper right corner). I didn't plan ahead and think about how to bake these to get a nice solid, sterile mycelium brick. Neither container will do well in the oven. Maybe I'll cut the containers away and transfer the mycelium/coffee grounds into a ramekin. 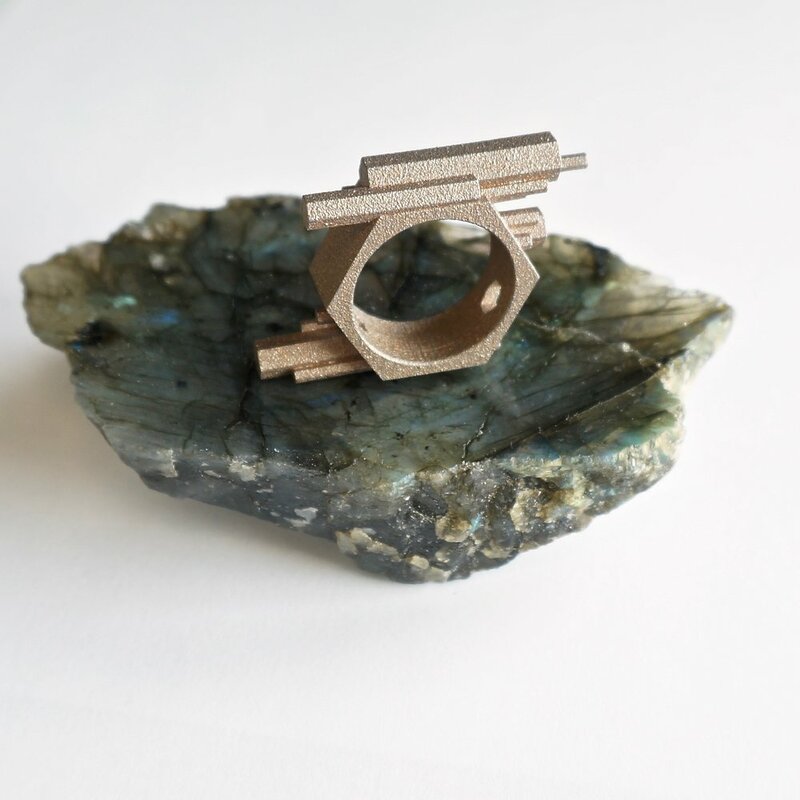 Ecovative has a very interesting way to design materials. They grow mycelium (part of the mushroom lifecycle) and dry the mycelium to replace packaging material, surfboards, insulation, and other application. I want to try this process out my self to get a better understanding of the material properties of mycelium. Ecovative grows mycelium on agricultural waste (like corn stalks), but I am starting out with something easier, coffee grounds. Mushrooms grow by breaking down nutrients in biomass (corn stalks or coffee grounds). Microorganisms can also grow on biomass and compete with the mycelium. This would ruin the experiment. So, any biomass used for mushroom food needs to be sterilized. Cornstalks would need to be autoclaved. 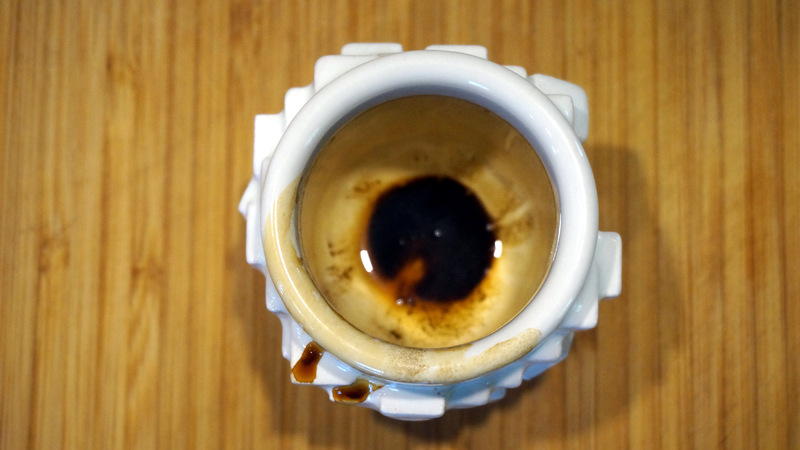 Luckily, coffee grounds are saturated with boiling water, so they are sterile just after use. I looked around my backyard for different kinds of mushrooms. I haven't identified the species, and I do not know which species produce the strongest mycelium. We'll find out. I found two species, one growing on a log and one that looks like a pile of spores. I placed the mushrooms and spores in fresh coffee grounds (I shook the spores in the bottle to distribute them. I used an empty plastic water bottle and an old plastic container covered with plastic wrap. Both environments are moist, but have holes for air flow. I've placed both containers in a warm dark place (the laundry room). Now we have to wait a few weeks for the mycelium to grow. Hopefully a white fuzz grows throughout the coffee grounds! This weekend I thought it would be fun to grow moss on a minimal surface. Moss is an interesting living addition to many surfaces (e.g. moss graffiti). Minimal surfaces are the minimal surface needed to connect given boundary conditions (like soap bubbles forming inside a ring of wire or a circus tent draped on poles. The wire and poles are the boundary conditions and the shape of the bubble and tent is the minimal surface). Minimal surfaces are also recognized as having high surface area to volume ratios and being good substrates for cell growth. Minimal surfaces have attracted the attention of architects who use them to minimize weight and materials. Because of their high surface area to volume ratio (and thus minimal material requirements) minimal surfaces are an interesting way to explore efficient vertical farming. I chose to use a 1/2 scale, 1/4 resolution model of the Voronoi Tower by Dizingof (modified by RichRaf). Here is the STL file. This model resembles an organic tower. My sister kindly printed the tower on her Ultimaker. I selected what I hope are two different types of moss, one Acrocarp and one Pleurocarp. Acrocarps have upright growth, branch a lot, and are slower growing. Pleurocarps grow as a carpet, they grow faster, and and they attach to hard surfaces better. Additionally (and more challengingly) pleurocarps can tolerate constant moisture while acrocarps cannot. I arranged bits of moss on the tower, preferentially placing the pleurocarp on the top and the acrocarp toward the bottom. To grow the two different types of moss on the same tower I am halfway covering the structure with a glass to retain moisture at the top and allow airflow at the bottom. If this does not work I expect one of the mosses to take over. (I may keep it covered more because it looks cooler). I will report on new growth in a few weeks.